I wanted to make pink velvet cupcakes for our daughter’s fourth birthday, but she insisted on a Palace Pets Birthday cake. So when the girls asked to bake their Daddy cupcakes one rainy afternoon, I thought, hmmmm…maybe I can convince them to try these! 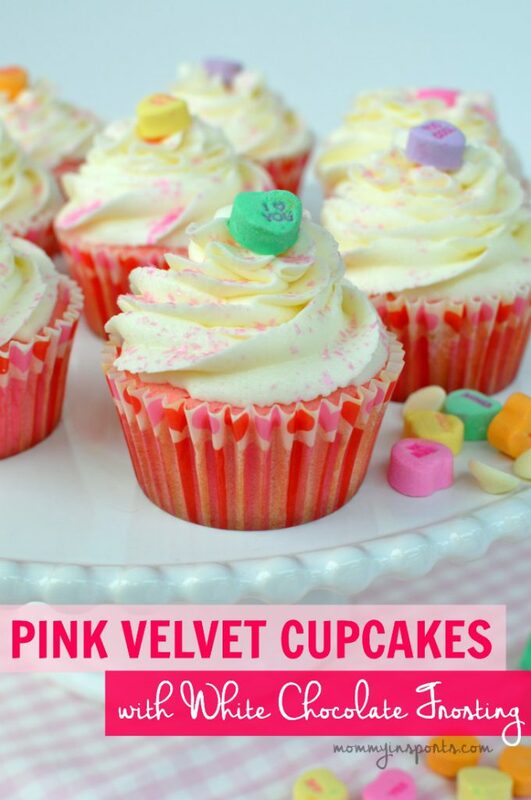 I mean who wouldn’t love Pink Velvet Cupcakes with White Chocolate Frosting? 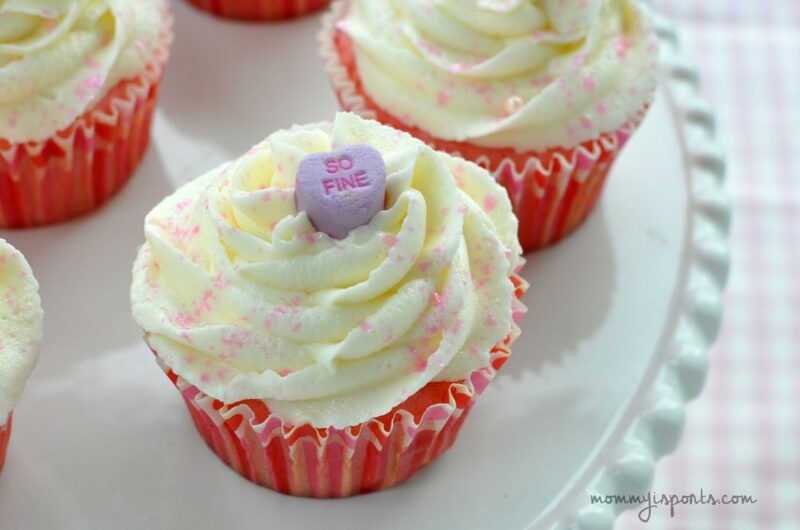 Plus with Valentine’s Day on tap and our recent Dollar Tree cupcake liner purchases, I knew we had all the fixings for these moist, delicious, yet festive cupcakes! 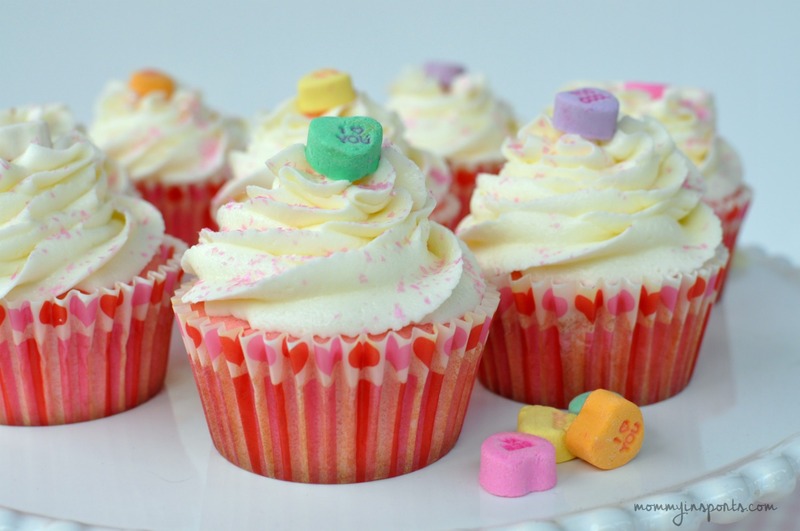 And conversation hearts make the perfect sprinkles! But contrary to the title, pink velvet is not like red velvet, there’s no chocolate in these babies! Just good old-fashioned white cake tinted pink, but using buttermilk instead of regular milk. 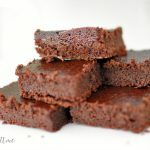 Not sure if this makes them velvety, but they sure are delish! And we added some white chocolate chips to the buttercream frosting and wow, what a rich yet scrumptious frosting! Paired with this pink velvet cupcake recipe from Taste of Home, these cupcakes weren’t too sweet. It helps that the cake is light on sugar, but big on taste! So if you are thinking of whipping up a special treat for someone you love, try these, with my white chocolate buttercream recipe below! 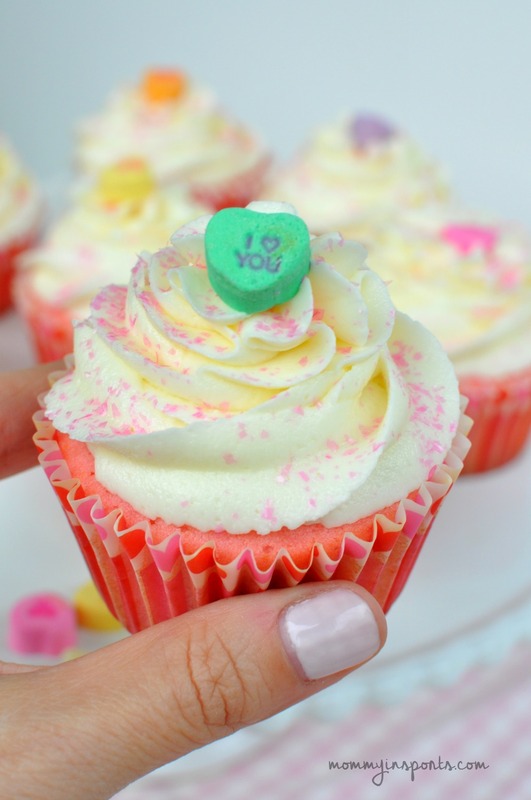 Nothing says “I LOVE YOU” like a Pink Velvet Cupcake with White Chocolate Frosting! Easy peasy rich white chocolate buttercream! Start by melting the chocolate with 1/3 cup heavy whipping cream. If microwave, melt at :30 increments on 50% power. Takes around 1:30 to complete, stirring in between. I like just one stick of salted butter, if you only have unsalted butter add a dash of sea salt! For more great recipes, don’t forget to check out my Pinterest boards! 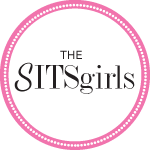 Follow Mommy in Sports’s board Cupcakes on Pinterest. Yummy!! I can’t believe something so amazing-looking was so easy!! These look yummy! We love making cupcakes. Will have to add this to our list!! Yumm! These look delicious! Pinned! I’m all for easy recipes. I would’ve never thought about mixing in white chocolate to the buttercream frosting. I’ll have to try this for the kids. These look amazing! I love white chocolate. Perfect for Valentine’s Day. 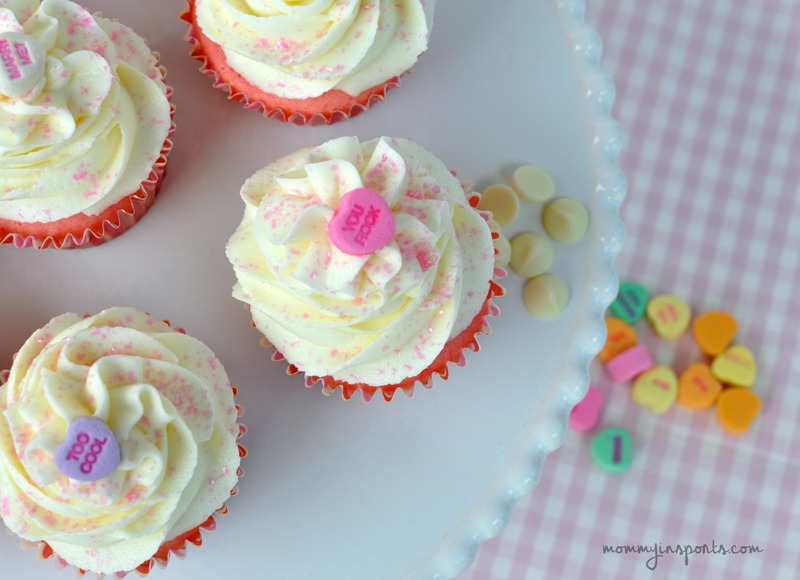 half the goal of cupcakes is making them look pretty – you did that! They’re really pretty – you certainly have a knack. No matter what they taste like, my cupcakes often look sloppy. I’ve also never made white chocolate frosting. I’m intrigued because I’m a big buttercream fan. I don’t like cream cheese frosting. So I love different spins on buttercream. HAHAHA so I go to check out your Pinterest board and it’s cupcakes galore and I think, “I knew I loved this lady for a reason.” HAHA! 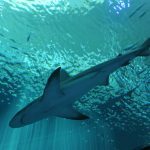 These look gorgeous – and you did a fantastic job with the photography! Seriously looks better than those food photographers on the Food Network Challenge shows!! !